Welcome to a new edition of The Feed! It’s been awhile since we have touched on a sports nutrition topic but today is the day and we have a great information packed show all about Creatine! I am sorry to say that the Spring Athlete Q and A was Coach Kelli’s last show. Kelli will remain a Positive Performance Coaching Partner and is working on some exciting things at Apex Nutrition and needs more time to heal from her injuries and to focus time on her new business endeavors. I will be taking over The Feed and may look for new hosts to help out for future feature shows. So if you are a professional in the world of endurance sports that would like to have their own feature produced let me know I would like to speak with you. One of Coach Kelli’s top rated editions of The Feed was a show on Beta Alanine, an amino acid with amazing buffering abilities. If you missed that show do yourself a favor and have a listen! Ever since the show on Beta-Alanine, I wanted to cover another supplement that can do wonders for athletes and that is Creatine! Before we dive into the Who, What, When, Where, How and Whys of Creatine I wanted to let you know that my information comes from a number of sources that I will cite in the show notes. Many of the websites that I cite in the show notes will have their own citations. So while I enjoy debate and the freedoms of public discourse please read all citations and notes before you decide to challenge any of this information. Otherwise, I welcome your comments! You can expect that all of the information presented in this show came from a myriad of medical, clinical studies and other sports science and evidence-based supplement sites based in real science NOT BRO SCIENCE! Never heard the term BRO SCIENCE before? It simply means results shared by gym rats based on anecdotal accounts with little or no scientific evidence or efficacy. One more item before I dive into answering all of the promised questions, I chose Creatine as my subject for this edition of The Feed because it does have value in training and is likely the most studied sports supplement on the market today. When searching Google for Supplement Studies I turned up 320 million links. When I searched for Creatine Studies Google turned up 1,140,000 studies. When I searched for studies of other popular supplements such as Whey Protein and BCAAs they didn’t turn up more than combined value of Creatine Studies. The only other nutrition based study with athletic performance in mind that had more results were studied on the performance of carbohydrates. NOTE: Before you get out pencil and paper for the show I want to let everyone know that this show will have extensive show notes. To find the show notes simply go to PositivePerformanceCoaching.com/blog/ or search for the show title on our website. I would also like to let everyone know that the 100th Endurance QuickCast episode is coming up soon. The 100th show will be all about riding centuries whether its 100miles or 100km. So get your questions ready! What does creatine do for athletes? Can’t I get enough Creatine in my daily meals and why do I have to supplement? Who would benefit from supplementing with Creatine? Why would you consider taking Creatine? When is the best time to consume Creatine? Where in your training plan will Creatine have the greatest benefit? First and for most I do not condone doping of any kind in sport! I do however want athletes to be educated on what is marketed to them as athletes. Creatine as a supplement may or may not be beneficial to you in improving your training or competition performance. You should also seek out professional medical guidance before taking any supplement or beginning any new training program. Lastly Creatine in its many forms is not labeled as a Performance Enhancing Drug but is labeled as a supplement or as an ergogenic aid by most sports governing bodies. If you are not sure if Creatine consumption is allowed by your sports governing body then the responsibility is on you to determine the rules of creatine consumption by your sports governing body! I Coach Rob am not telling you the athlete that you MUST consume Creatine for any reason what so ever. In the context of sport, an ergogenic aid can be broadly defined as a technique or substance used for the purpose of enhancing performance. It is also believed that there is a mechanical component to in describing ergogenic aids in sports. The typical categories of “legal” ergogenic aids are Mechanical Aids, Supplemental/Nutritional, Physiological, and Psychological aids. I will go into greater detail in an upcoming webinar on ergogenic aids. Creatine is a nitrogenous organic acid that occurs naturally in our bodies. You will more than likely read that Creatine is actually an Amino Acid as well. Creatine’s main role is to facilitate recycling of adenosine triphosphate (ATP), the energy currency of our cells, primarily in muscle and brain tissue. Creatine phosphate helps make a substance called adenosine triphosphate (ATP). ATP provides the energy for muscle contractions. This is achieved by recycling adenosine diphosphate (ADP) to ATP via donation of phosphate groups. The human body produces about 1 gram of the creatine daily. When coupled with an omnivorous diet we can consume another gram of creatine daily as long as our diet includes foods such as meat and or fish. Most of the creatine produced and consumed resides in skeletal muscle and the remainder is found in the blood, brain and some other tissues like the kidneys. The simple explanation is that Creatine serves two and maybe even 3 purposes for athletes. It is required for the creation of ATP which our muscles need to contract, it also works as a PH buffer similar to Beta Alanine but arguably not as effectively and quite possibly as a Nootropic with effects showing cognitive enhancement and possibly cognitive protection. Examine.com states: Creatine is one of the most thoroughly researched compounds, and no adverse side effects have been noted through supplementation. Who is Examine.com? Examine.com states that they are an independent and unbiased encyclopedia on supplementation and nutrition. Their writers and researchers include PhDs, MR, RD, Biologists, Sports Scientists and a Bioinformatics experts. NOTE: They make money at Examine.com through selling guides on supplementation. There is a positive relationship between muscle creatine uptake and exercise performance. It is regularly reported that creatine supplementation, when combined with heavy resistance training leads to enhanced physical performance, fat-free mass, and muscle morphology. A 2003 meta-analysis showed individuals ingesting creatine, combined with resistance training, obtain on average +8% and +14% more performance on maximum (1RM) or endurance strength (maximal repetitions at a given percent of 1RM) respectively than the placebo groups. Creatine has demonstrated neuromuscular performance enhancing properties on short duration, predominantly anaerobic, intermittent exercises. For short high-intensity exercise, creatine supplementation resulted in a 7.5 ± 0.7% increase from base line, which was greater than the 4.3 ± 0.6% improvements observed for placebo groups. Creatine supplementation has also shown promise during multiple high-intensity short duration bouts (<30 s). This would indicate that creatine supplementation might be useful to attenuate fatigue symptoms over multiple bouts of high-intensity, short duration exercise. It also appears that creatine supplementation has the most pronounced effect on short duration (<30s) high-intensity intermittent exercises. Can’t I get enough Creatine in my daily meals why do I have to supplement? You don’t have to supplement with creatine at all as an endurance athlete! As stated earlier the average adult makes 1 gram of Creatine per day and consumes 1 gram per day in an omnivorous diet. I could not find research on if vegetarians or vegans could benefit from supplementing with creatine for day to day health concerns. There are MANY forms of Creatine on the market today and I probably even missed a few. The big list includes Creatine monohydrate, micronized creatine, buffered creatine, Creatine hydrochloride, Creatine magnesium chelate, Creatine Malate, Creatine nitrate and Creatine Gluconate. So which form is best? In all the studies I have read the typical conclusion is that the original Creatine monohydrate is likely the winner. I would like to add that while some studies say that the micronized version of creatine monohydrate do not offer any improvements in performance or the mitigate side effects I would say from my own anecdotal experience and the experience of other athletes that Micronized Creatine monohydrate does help mitigate weight gain, bloating and gastric distress. So in the earlier part of the show, it sounds like endurance athletes may not find Creatine supplementation beneficial. While there are some outlying studies that have shown some gains can be made in endurance it is for short duration efforts in the <30-<150 seconds along with an increase in time to exhaustion when completing multiple bouts of explosive intervals. Also, the increases in 1RM in strength tests are where creatine really shines. So for those endurance athletes that are involved in strength training and regularly utilize explosive intervals or longer intervals such force work lasting approx. 150 seconds you will likely see descent performance gains in a 5-6 week period. The consideration or choice to supplement with creatine is really up to an athlete and their chosen/assigned medical professional. With the examples given of who would benefit from supplementing with creatine, I can think of many cross sections of endurance sports that could benefit in training. I am not 100% sold that are any hidden benefits in competition other than the improved muscle contraction and somewhat improve time to exhaustion seen in training which should lead to better performances in competition. 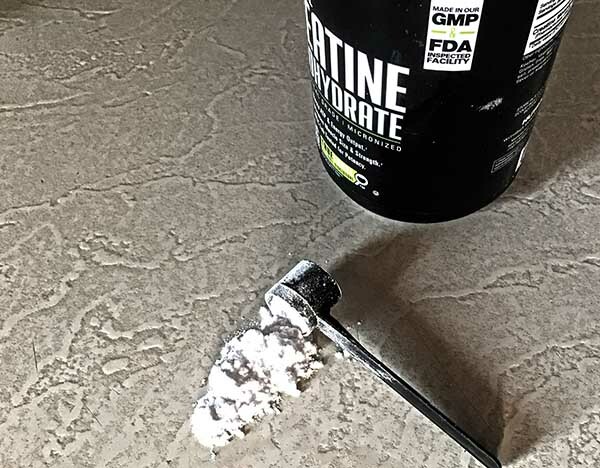 An example of old school loading (for adults ages 19 and older) is to take 5g of creatine monohydrate, 4 times daily (20g total daily) for 2 to 5 days maximum. Then take a maintenance dose of 2g daily for 6-8 weeks before cycling off of creatine supplementation for 1-3 weeks and starting the whole process over again. While it is not necessary to have a load cycle with creatine it will take longer for muscle saturation if an athlete were to consume only 2 grams of creatine per day. By only consuming 2 grams per day of micronized Creatine Monohydrate many of the unwanted side effects such as gastro discomfort, diarrhea, bloat and quick weight gains may be mitigated by taking the smaller dosage over a typical loading phase. Your body may absorb creatine better when you take it with carbohydrates, such as fruits, fruit juices, and starches. It has been documented that citric juices or juices with higher acid contents may blunt the effects of creatine or even enhance gastric distress. Some athletes and trainers have reported that stacking Creatine with the supplement D-ribose has similar effects as to using a carbohydrate. The big question for nutrition and supplementation has always been the timing of intake, not just dosage. Creatine timing has been studied and it appears that there is a small benefit of taking creatine post workout in older adults. Research has shown that these gains were very small when creatine was taken post vs. pre workout. For those that are prone to upset stomach then post-training, supplementation would likely be more beneficial. If you are utilizing a periodized, polar or block training program the greatest effect I have seen with creatine is during the following strength training phases: Anatomical Adaptation, Max Strength, Muscle Endurance and Power Endurance. Even though studies have shown that Creatine can improve short duration high-intensity endurance efforts I have only seen it significantly improve performance in running sprint intervals and plyometrics. Not in the sense that creatine makes you run faster or jump higher but that it allows you to do more of it. Let us know what you think about using Creatine in sport or training. Have you tried it? Has it worked for you? Do you think it should be banned? Are you planning on supplementing with creatine?